The Caldwell United Methodist Church called IDC youth group to join an interfaith build event on March 18 and March 19, 2011. 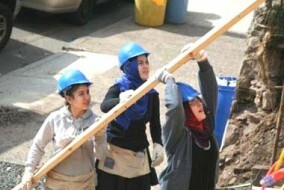 Jewish, Christian and Muslim youth worked together for two days in construction of a home in Paterson. Students from Pioneer Academy of Science represented the IDC. These homes are built by Habitat for humanity for low income families. Paterson Habitat for Humanity creates homeownership opportunities for families with limited income. In their 25 years history Habitat completed 216 homes and helped 229 families achieve the dream of homeownership.